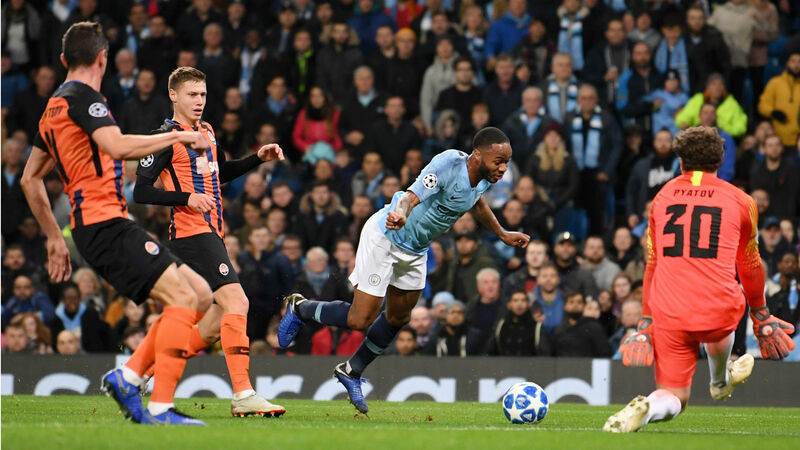 Manchester City manager Pep Guardiola believes Raheem Sterling has received unfair criticism following a controversial penalty incident against Shakhtar Donetsk. Sterling tripped when through on goal during City's rampant 6-0 win over the Ukrainian champions, having kicked the turf when shaping to shoot. Referee Viktor Kassai incorrectly ruled that the England winger had been felled by Mykola Matvyenko, however, awarding a penalty that Gabriel Jesus converted. Sterling subsequently apologised for not informing the referee of his mistake, although Guardiola insisted that the City forward, who has signed a contract extension until 2023, was right not to do so. And, ahead of Sunday's Manchester derby, Guardiola has again come to the 23-year-old's defence. "I think this time I realised it's unfair because I don't know why you should criticise Raheem," Guardiola told a news conference. "It's not diving either. Tripping is a mistake, it was a bad decision of the referee. "He's an incredible guy, he does absolutely everything on the pitch, fighting in front and he made a mistake because he's 23 years old. "He maybe goes too fast, maybe he has to do it slower. Believe me, what the people said about this action I didn't understand. "He will become stronger, he's stronger than when we met each other in the first year. Now, he controls these emotions much, much better."